Hogun is a Marvel character who is a member of the Asgardian Race. He is a friend and compatriot of the hero Thor. Hogun is most often attached to a group of Thor's friends called "The Warriors Three". Hogun is played by Tadanobu Asano in Thor and Thor: The Dark World. Hogun is often referred to as the Grim due to his short, taciturn form of communicating and brooding personality. He is the most thoughtful of the Warriors Three but also the most pessimistic. He is the only member of the three who is not Aesir (With Asgard not being his native homeland). His homeland has never been named in the comics but is known to have been conquered by the Mogul of Mystic Mountain. The Mogul of Mystic Mountain is one of Hogun's bitterest enemies as he not only conquered his home but also killed many of his people and family. With the help of Thor he battles and defeats the Mogul. Despite his dour demeanor Hogun is very noble and always loyal to his friends. He is the first to attack Loki when he usurps the throne of Asgard. He is nearly killed but Sif jumps before him and tells Loki that if Hogun is kills he will need to kill her first. Loki relents. Hogun is generally seen using a mace but not always. He collects and is a seeming master of a wide variety of weapons. Hogun has had many adventures with the Warriors Three and Thor. He has battled Mangog, Thermal Man, Surtur, Mogul of Mystic Mountain, the Destroyer, Loki, Flying Trolls of Thryheim, Fafnir, Mephisto, Hela, Ego-Prime, Xorr, Ssthagar's Slavers, Mercurio, Zarrko the Tomorrow Man, Spoor, Grey Gargoyle, Enchantress, Skurge the Executioner. Hogun perishes in Ragnarok but is found reborn like most of the Asgardians by Thor. He helps defend Asgard in the Siege event where Norman Osborn's forces assault the kingdom. Hogun is very good with a variety of weapons. In particular he seems to be a master with a mace and bludgeoning weapons. He also been shown to be an adept healer and battle strategist. In the MCU Hogun comes from Vanaheim but joined up with Asgardians to go on adventures. 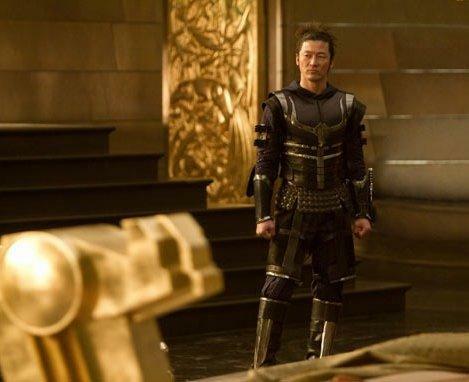 Hogun is played by Tadanobu Asano in Thor and Thor: The Dark World.